Affiliate marketing is a business model that has been around for a relatively long time, giving advertisers a new model to structure their marketing campaigns. For those of you who don’t know what Affiliate Marketing is, then here is a quick description. Affiliate Marketing is when a link is directed towards a product or form that then hast he potential to be brought or filled in. The publisher who hosts the link then has the ability to earn money through referring the link to a customer. The first integrated and used affiliate program was developed on the Prodigy network, an online service created in 1984 via a joint venture of IBM and Venture. The Prodigy Network was conglomerated over a broad infrastructure designed to give paying users information regarding news, weather and banking stocks. The network allowed users to dial up to their local server, which then connected to the main networks server located in New York. This meant most times dial up was free, due to calling locally, but this ultimately ended Prodigys legacy as costs were ridiculously high. Prodigy had unique design ideas consisting of a GUI and socially intergratable concepts such as chat and email. This helped stage the network as one of the countries (USA) first online communities. One of the first shops/companies to develop a computerized business model over the Prodigy Network was PC Flowers and Gifts which was implemented in 1994, a clear 10 years after the initial conception of the breakthrough network. The first internet patent for an automated sales system took time to clear, there was now the chance for a new advertising model. The present server based communications system provides dynamic customization of hypertext tagged documents presented to clients accessing the system. The customization, which pertains to the content of the documents, is based on the specific requirements of a class to which the client belongs to. After a while The Prodigy Network began creating advertisements on every one of its pages, ranging between $10-20k per advert. It became renowned for being the virtual shopping mall, allowing people to view and buy products that they may not venture around normal shops for. Following this PC Flowers began its patenting to create one of the first affiliate programs. The Prodigy Network ran on extremely low speeds 1200bit/s to 2400bit/s. This meant PC and Flowers had to design a system capable of running optimal functionality with minimal challenges for download/upload speeds. The Prodigy Network was generating greater traffic, and in 1994 alone PC Flowers and Gifts generated $6million in sales. After this they contributed a proportion of their earnings to the network directly. This is when the initial concept for affiliate marketing was developed. Further down the line, PC Flowers and Gifts decided to take their concept one step further, and released the use of affiliate programming to over 2,600 programs. The social impact of such a concept would have been massive. It enabled the growth of e-commerce to a wider scale. At the times shops were dedicated concepts that had to be found uniquely, or through the basic functions in The Prodigy system. Affiliate connections meant advertisements were cropping up, enabling consumers to expand their browsing and purchasing range to try new products – it was the beginning. Even though not many people ran computer systems in 1994, those who and especially those who ran a service such as Prodigy would have had a greater disposable income, meaning shopping ‚online’ was an added bonus to a unique user experience. Stepping forward ever so slightly, we can focus on the darker side of the internet, an area which has been at the forefront of modern design and implementation. The adult industry. There are rumors that the website Cybererotica was a pioneer in the affiliate world, even though it was developed and integrated after PC Flowers and Gifts patent. The adult affiliate networks ran a CPC model which has slowly diminished into a CPA model due to fraudulent reasons – this is also the case for nearly all adult affiliate networks now. In 1994 Cybererotica saw a gap in the market which could be filled. People had easy access to adult based content for the first time in their lives. Affiliate programs saw this gap, and knew that people would be interested in clicking on half naked individuals, and it worked. Today the same marketing models are still being used to obtain higher click rates on adult based websites, not much has changed. Stepping forward ever so slightly again, we enter the bigger picture, Amazon. Launched in 1996, Associates is Amazon.com’s affiliate marketing program. By linking to Amazon products and services you can add compelling content for your site visitors enjoyment and receive up to 10% in referral fees for doing so. Amazon took the idea of affiliating and expanded the concept. After starting in 1996, they realized other retailers would be interested in using their platform to sell products. The story goes that Jeff Bezos was in contact with a writer who was trying to advertise her book. Jeff decided to offer the writer hosting through advertisement of her publication in return for a percentage of the sales. From then on, more and more publishers and advertisers were interested, and Amazon pushed forward. Amazon services now cater for a vast proportion of affiliate marketing, covering different products all over the internet. 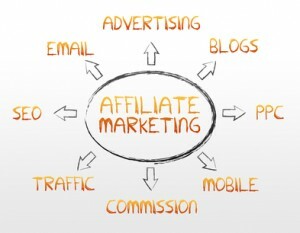 These early steps regarding affiliate marketing are key to where we are now. During those times computer use was much lower than now. Advertising agencies relied heavily on traditional media, such as print and television. The cost of such services is incredibly high. Startup companies or products had no easy way of encapsulating themselves in markets that were over flooded with traditional media. Internet marketing gave smaller companies a break, a chance to push their product to different consumers. Affiliate marketing took it one step further, and allowed advertisements to be directed to the relevant audience. Targeted ads enabled niche market companies to not waist money on mass advertising. However back in 1996, the form of advertisement a consumer would receive would not be as subtle as todays affiliate programs. They were basic Flash or obtrusive imaging, based on buy now, in your face advertisements which started putting consumers off. Many times the direction of the advertisement was wrong, this was not something that was controlled at the time. People felt like they could not trust the links. This ideology continued for a long time. Most of the internet was being covered in adult based content, connecting to dialers and subscription pages. It wasn’t the greatest way to build a trusting consumer model. The PPC (also known as Cost Per Click) principle was implemented in 1998 by Jeff Brewer of GoTo.com. This was the first time this concept was used effectively. However competitors began spam clicking other peoples adverts to increase their costs. In 2000 Google released Adwords, the common affiliate program many of us still use to advertise on the Google search area with text and image ad placement. This system ran a CPM method (Cost Per Mille) which aggregates the CTR (Click Through Rate) and the CVR (Conversion Rate). CPM is a common form of advertisement as it judges one click over 1,000 views and estimates how much the campaign would cost you per thousand people. Google Adwords does not focus on this system as much now, and has tightened up its policy and regulations in terms of PPC. Affiliate marketing is changing heavily even now. People are still creating their own affiliate campaigns, building their own links and arranging deals with advertisers or publishers themselves, but there are alternatives. Companies now work on establishing strong relationships with advertisers and publishers to create their own affiliate campaigns. YieldKit.com, VigLinks and Skimlinks are at the forefront of these technologies. One thing has to be mentioned, it is much easier for everyday users to become an affiliate now. Anyone can create a blog, signup to Adsense, and begin a marketing campaign. In Mid 2000, everyone was spammed ‘Sign up now and earn $10k per month’. This method has now backfired, and the market is saturated with people trying to become affiliates. For a daily user, it’s great to try and earn some extra money with your site, install a product like YieldKit and your away. To become a profitable affiliate though, time, dedication and commitment are needed. Times change for a reason, and we have to anticipate the future. Mobile affiliate marketing is becoming huge, with different networks cropping up all over the web. We have to prepare, because even over the 20 year period since affiliate marketing came about, the implementation methods linked to affiliate marketing have changed dramatically. Planning for the future is essential – look at your markets, find a trend and run with it. No market is too saturated, there should always be space for a new design or model to be integrated. This guest post was written by Blogging Geek – Robert Walker who is a 23 yer old graduate from England. He studied Broadcasting at University College Falmouth. Currently living in Hamburg, Germany finishing his second Praktikum in Communications and Social Media at YieldKit, an affiliate marketing company. His passion is implementing and contructing new and interesting ideas or concepts through writing.